1. Lightly spray nonstick skillet with nonfat cooking spray and heat over medium heat. 2. Add beans to skillet; sprinkle with onion powder, garlic powder and chili powder, mix well. 3. Add corn and green chilies to bean mixture and cook, stirring frequently, until heated through. 4. Add salsa to skillet and cook over medium heat; reduce to low, cover and simmer 10-15 minutes. 5. Warm flour or corn tortillas in oven; serve tacos with lettuce, sour cream, tomatoes and shredded cheese. 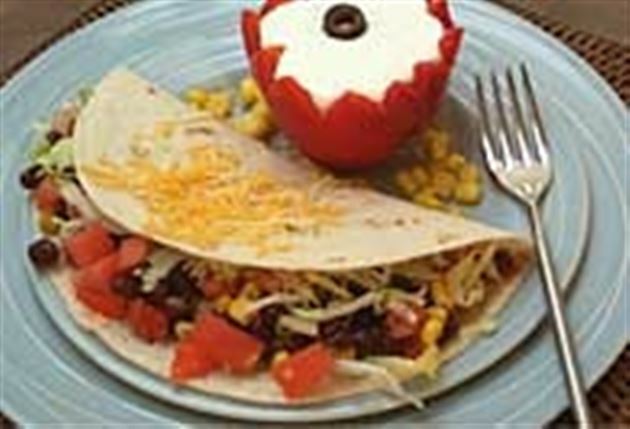 Enjoy this delicious rockin' tacos vegetarian Mexican recipe!